You’ll find the entrance to this popular, 5.2-mile trail just after crossing Abrams Creek, which is located about 4.8 miles into your drive on the Cades Cove Loop Road. A right turn on the first gravel road after the creek will take you to signs that point the way. This trail attracts up to 1,000 hikers a day, and you can expect a scenic hike that takes you along the creek and through forests of pine-oaks, rhododendrons, and hemlocks before coming to the stunning 20-foot waterfall. While this hike is considered moderate in difficulty, it’s important to note that this is one of the Cades Cove hiking trails that has some serious potential hazards due to the possibility of falling into the water. However, as long as you’re careful, hiking to Abrams Falls is a fantastic experience. Hikers looking for a strenuous workout will enjoy this 8.5 mile hike that is filled with wonderful things to see. You can park in the large lot that is located just at the entrance of the one-way portion of the Cades Cove Loop Road, and a short walk will take you to the trail’s entrance. In season, you can expect to walk through huge fields of incredibly beautiful wildflowers. 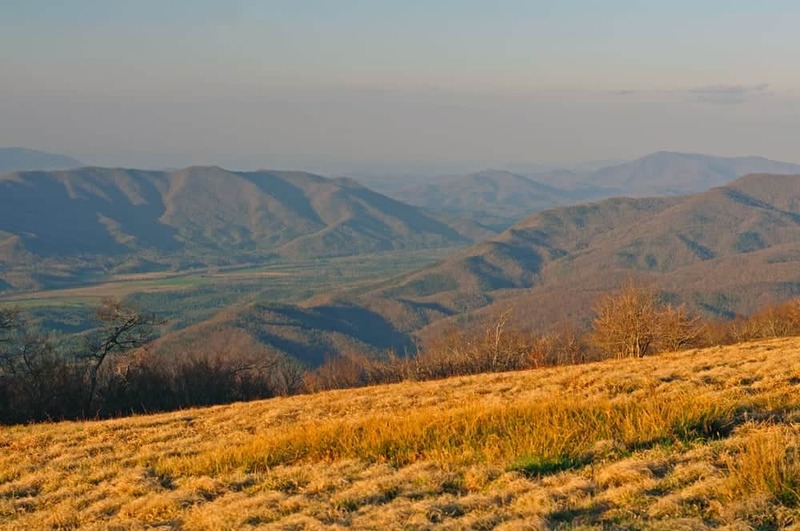 You’ll also pass by historical landmarks such as the John Oliver cabin from the 1820s, see the 25-foot Crooked Arm Falls, and have the opportunity to climb up to the Cerulean Knob, which offers great views from the highest point on Rich Mountain. This 8.8-mile hike offers amazing panoramic views, and you can expect to enjoy clear views of Cades Cove, Rich Mountain, Fontana Lake, Thunderhead Mountain, and Clingmans Dome. Azalea lovers travel from all over the world just to see the vast amounts of beautifully blooming azaleas from mid to late June, and your hike will take you into a beautiful 10-acre grassy meadow that was once used to graze cattle and is now filled with a stunning variety of wildflowers and wildlife. You’ll find the entrance to this trail a short 3.3 miles from Parsons Branch Road. You’ll have to make your way to this trail by starting out on the Anthony Creek Trail, which is located at the picnic area of the Cades Cove Campground. You’ll find some of the most spectacular views in the Great Smoky Mountains National Park, and you’ll likely be able to see Fontana Lake, Cades Cove, Townsend, Maryville, and even Knoxville from the summit of Rocky Top. Thunderhead Mountain is made up of three summits, so you can expect to do some climbing on this 13.9-mile trail. You should expect to walk through a rhododendron tunnel, see spectacular displays of mountain laurel, and find yourself at the 5,527-foot summit of the mountain. It’s easy to see why this is one of the most popular Cades Cove hiking trails! This 10.3-mile trail offers some of the area’s best views of the Great Smoky Mountains. This is definitely a trail you won’t want to miss during the month of June, because the hillsides and meadows will be completely covered in soft pink and white flowers. You can also expect to see herds of deer and other wildlife all year around. This trail is also accessible with a start on the Anthony Creek Trail that can be found at the picnic area of the Cades Cove Campground. To learn about the best place to stay close to these Cades Cove hiking trails, check out our complete guide to the Cades Cove Campground!